We had a wonderful week of golf at Cahir Park. We started on Monday with a Mixed Scramble. We had over 50 competitors with the winning team including the Captain Paul Eivers, Ricky Fitzgerald, Carthach Leahy and Rosemary Maher. Carthach exhibited tremendous skill reacted well to encouragement from Captain Paul with “Come on Tiger”. Paul, despite feeling a bit low after Cheltenham, played some exemplary golf culminating with an eagle chip on the 6th . Ricky and Rosemary made some valuable contributions from time to time and thoroughly enjoyed the day! Shay Hughes, Michael Burke and Margaret Costello came second. Third place went to Vice Captain Stephen Flannery who was most encouraging and helpful to newcomer Margaret Tobin, John Phelan and Kathleen Lonergan. The prizes were Spring Flowers all grown and presented by the Lady Captain, Marie Devitt. A tasty menu was available afterwards in the restaurant. Tuesday was the Seanoiri day. Their day started with coffee in the bar and the draw took place. There were 40 competitors. They played 9 holes in resplendent sunshine and enjoyed coffee and scones and cream afterwards. On Wednesday the club was closed as a mark of respect to our past President and founder member Albert O’Dwyer. Requiem Mass was in Kilmoyler Church. Cahir Park Golf Club formed a Guard of Honor at the cemetery. On Thursday over 30 ladies competed in a 9 hole stableford competition. The winners all had 20 points. So in a countback Michelle Keating H/C 17 was first, Breda Hickey H/C 28 was second and Josie Walsh H/C 28 was third. On Friday the Seanoiri had a draw at 10. All are welcome to this new draw time. On Saturday the ladies held another 9 hole stableford and Caitlin Fitzgerald H/C 13 won with 20 points. Also on Saturday Junior Golf has got off to a flying start with 30 young boys and girls. They are being trained by Neil and Susan Carey, Captains Marie and Paul and Colin O’Gorman. They will continue to meet every Saturday from 4-5. All are welcome. Please contact any of the Junior Committee for more details. Sunday was the final of the Race to St. Patrick’s Day. The sun was shining, and the race began at noon. In the Ladies section there were 16 players and first and second place went to two ladies who just started golf 2 years ago when we ran a Get int Golf program. They were Caroline Maher who is already playing off H/C 25 came in with a remarkable score of 42 points over 18 holes and Kathleen Alton playing off H/C 34 brought in 38 points. Ann Fitzgerald H/C 22 came third with 38 points also. In her thank you speech Caroline paid tribute to her cool and calm playing companions Francis Mc Carthy and Tommy Kinnane. She said it was just her day. The ball fell right. She had six pars and one birdie. She praised the condition of the course and was most appreciative of the kind words of praise from her fellow competitors. She is looking forward to the Minor Cup match on Sunday next in Cahir Park Golf Club against Mallow. 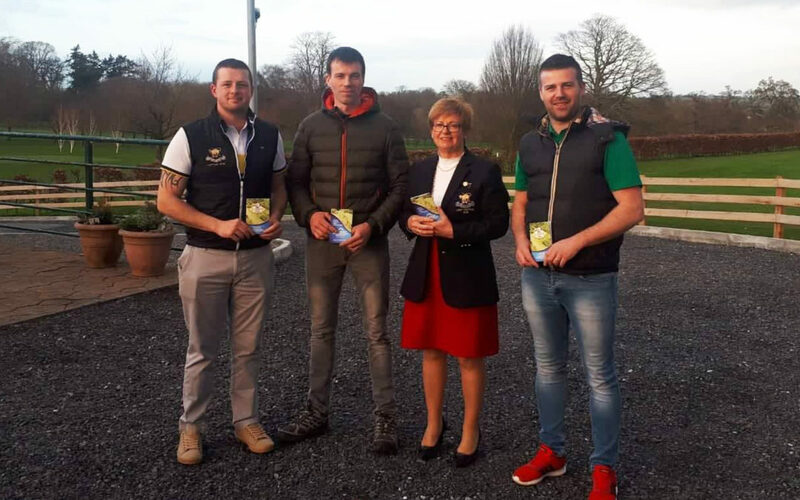 The culmination of the highly anticipated Murphy Fuels Race to Paddy’s Day final was played over 18 holes (9 twice) and conditions were good above head and below foot and the green staff delivered yet again. In the Mens Section there were 40 players. Top prize was snatched by the smallest of margins when James McCarthy posted 38pts. Next, we had Marcus McGee in second place with 37pts beating Shay Hughes (37pts) into third place on a narrow countback. Fourth place was claimed by Donal Mullane (also 37pts). Fifth prize was claimed by Tom Hickey with 36pts. Like the Ladies winner, Caroline, Jimmy said he not used to being on the winner’s podium, and he was pleased to be there and to win a GPS watch. He thanked all who organized the competition over the previous three months. Many thanks to all our members for supporting the Race to Paddy’s Day. Mens weekly open singles which is sponsored by Ned Grant was won by another McCarthy when the ever-improving William McCarthy claimed the spoils with 22pts beating Pat O’Connell (22pts) on a count back. Third place was PJ Phelan with 20pts. With the GUI season kicking off soon get your hands on the impressive club fixture list – available in the club. Happy Golfing Folks! The Ladies club are holding their first Open this Thursday March 28. This will be 18 Stableford. As there will only be 9 holes opened tee times will be between 9-11 and 1-3. Booking online or at the PRO Shop. This competition is being kindly sponsored by Healthy House, Cahir, who will be on hand to offer advice and information on Healthy Living. The Ladies will be running the usual 9 hole stableford at the weekend. We are looking forward to welcoming Mallow Golf Club for the first round of the Minor Cup. Congratulations to Jimmy Flannery who won €20 in this week’s Find The Golf Ball. Next week’s Jackpot will be €540. Total amount raised this week €214. Many thanks for your continued support. There are some extra spot prizes too. Jimmy Flannery had some advice for supporters. Come to the Club on Sunday and buy the last ticket to increase your chance of winning! This year, for the first time ever we have a Fixtures Booklet due to the generous sponsorship of Ned Grant, Builder. These booklets will also give information on club Dress Code. Please make sure you get your free copy in the club. Our bar and restaurant are making quite an impact. The menu is varied, and the food is good. Keith, our manager, is keen to facilitate. Mother’s Day is already booking up fast. So, to make that important reservation, don’t forget to give Keith a ring using option 4 on main golf club number 052 744 1474.